I don't find this book very useful. While there are tutorials, the instructions are often vague. The subject matter are often too brief and not comprehensive enough. They do tell you the tips and techniques involved in achieving certain effects, but they either don't show you the process of getting there or several steps are missing and you have to guess how it was achieved. There's a beginner example on using photos as reference. It's about putting a car onto a background with mountains behind basked in beautiful sunset. Step 1 involves finding a beautiful photo of the background. Step 2 involves finding a photo of the car. Step 3 is the final result of the car basked in the same beautiful sunset as the mountains. The example do mention that lighting and reflections were wrong in the car to begin with, but it never actually showed how they were corrected. And just like magic, the final result painted itself. That happens often in the book. 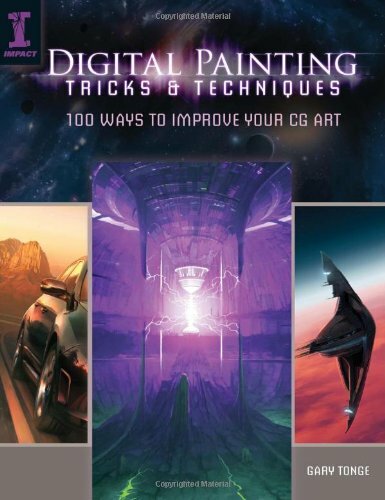 If you're absolutely new to digital painting with no knowledge at all, yes, you can learn from some of the tips. But even then, I won't really recommend this book because for the same amount of money, you can get better books.